It is strongly recommended to configure a default language and culture/regional setting (i.e for format of dates and decimals) and to make sure that you enable the language or set of languages your Bizagi Work portal will support. Note that Bizagi Studio is available in English in Spanish, though the Work portal is shipped with more than 10 languages available, and fully supports any other language while requiring an input of translations. Further information on this is described at Language configuration and localization. The default language will be the default one, that is, the one all end users see in their Work Portal for a specific project. To define the Default language for the Work Portal you must change the Bizagi Global Culture configuration. Open the Business Configuration menu and go to Localization group. In the first option select the language you wish to define as default from the drop-down list. How to enable languages and translations? 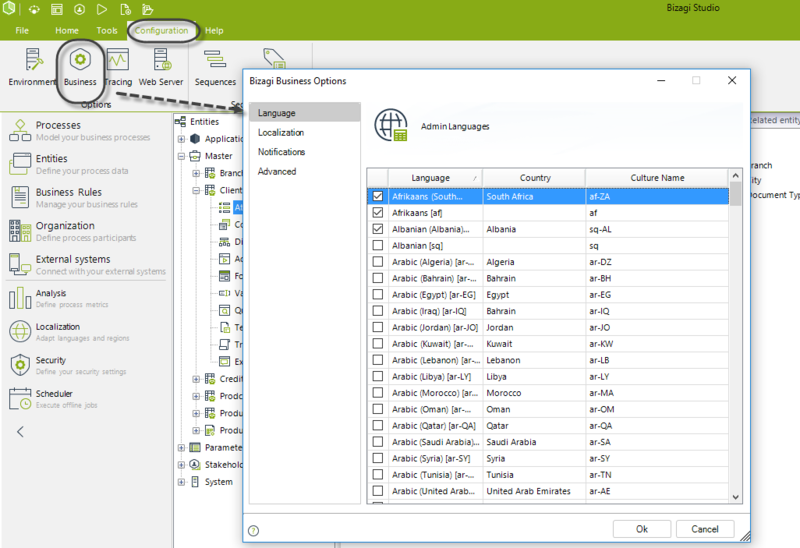 The first step for language configuration is to enable the language you want your Bizagi Work portal in. If you will be using more than one language as a possibility for your end users, then you would need to enable each of those languages. 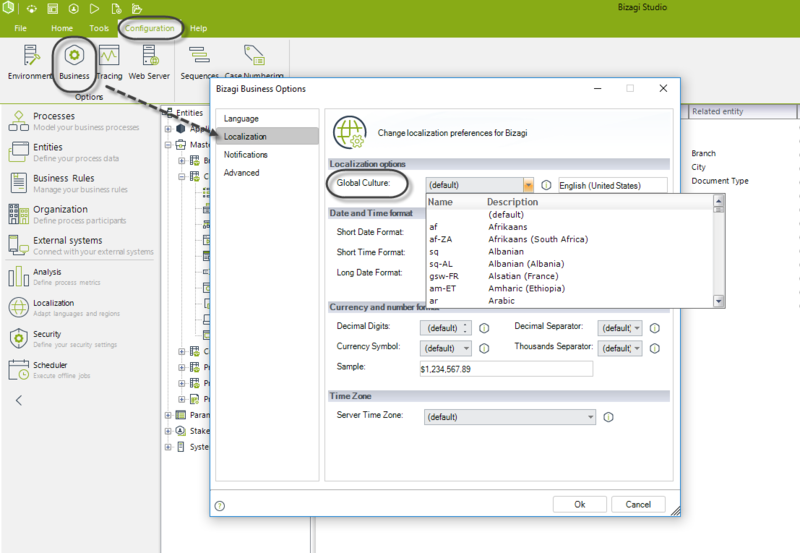 To enable languages from Bizagi Studio go to Configuration options, and select Business. The first menu is Language where all languages are listed to be chosen. Check the Enabled box(es) corresponding to the language(s) you want to support. Ideally, enabling languages is a task done in the development environment when implementing your processes and planning on your project's language support (recommended in order to carry out user acceptance tests and adjust translations as necessary). However you may also do this in a live production environment, given that such options are presented in Bizagi Work portal as well. To view more information about how to do this from the Work portal, refer to Multi-language support. •Include translations for Work portal labels only if you chose a language which is not shipped in with Bizagi. To learn how to do this for the Work portal labels from Bizagi Studio options, refer to Translating your Work Portal from the Studio. •Localize object names and labels of your own specific implementation, only if you will be using more than one language for your end users. To learn how to do this from Bizagi Studio options, refer to Localizing processes and their objects from the Studio. •Bizagi uses the ISO 639-1 standard to name languages. This standard uses four letters: the first two letters identify the family language, the second ones identify the country. For example: en-us (American English), en-gb (British English). If no localization has been defined for a specific language (i.e en-gb), Bizagi will use the localization defined for the parent family language (i.e "en"). Complete details on this standard specification relates to the Part 1(ISO 639-1:2002) at https://www.iso.org/iso-639-language-codes.html. •If you enable a language that requires Unicode characters, you need to make sure your database supports Unicode. For instance when using Oracle, you have to make sure that the Oracle database uses an Unicode-compliant character set. •All configuration regarding enabling languages, and inputting or editing translations for any languages necessary is available from either Bizagi Studio or the Work portal administration options. It is recommended to define language settings and localization in the development environment (though Work portal options can be used), in order to carry out adequate user-acceptance tests before going live.